A polisher or hair lotion for daily maintenance is highly recommended after a relaxer treatment. Step 3. Part hair into 4sections. Step 4, Wearing protective gloves, apply a generous amount of relaxer to the most resistant area first using the back of a rattail comb or application brush. 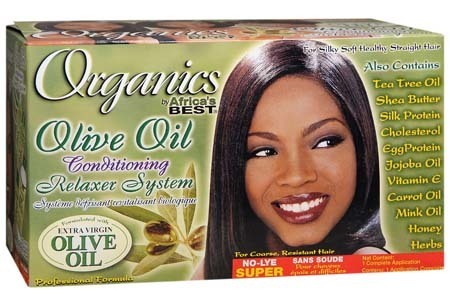 For previously relaxed hair, apply only to new growth. Avoid overlapping onto previously relaxed hair. DO NOT apply to scalp. Parting in thin sections, continue application throughout entire head. Apply to hairline last. With fingers or back of rattail comb, gently smooth hair following the order of application, until desired straightness is achieved. (DO NOT exceed recommended timing. See Timing Chart). Step 5. Rinse thoroughly with warm water for at least 5 minutes and apply a generous amount of Neutralizing Shampoo. Work into a rich lather to remain on the hair 2-3 minutes before rinsing. Repeat process untill chemical is completely washed out. Step 6. Towel dry and apply Replenishing Conditioner per product directions.